The new Atari CX85 Numerical Keypad is an add-on, ten-key number pad (adding-machine style) with seven additional function keys. Its primary use is to make it easier to type in numbers. The Keypad was originally developed for use with the Book­keeper software package, but is now available separately. The keypad plugs into the second joystick port. 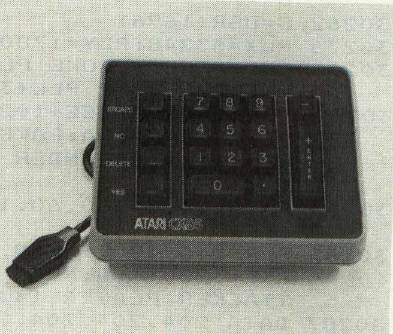 Using it from your program could be pretty tricky, except that Atari provides a handler program that reads the keypad like a joystick and causes it to respond like the built-in keyboard. With the handler program, you can immediately use the keypad in almost any program, including those you write in BASIC. It's especially valuable for VisiCalc, where you are constantly working with numbers. The handler program is provided only on disk. To use the keypad, you boot the handler diskette first, then insert your applications disk (such as VisiCalc). The handler loads into a usually unused area of memory ($0600, page six). This conflicts with some programs, especially machine language routines that also need page six. The handler disk also contains the assembler source code of the handler and an alternate version of it that lets you define your own function keys. It's a well-made peripheral. It has an extra-wide zero key and a raised bump on the "5" key; both are accounting standards. The keys have a nice feel, similar to the Atari 800 keyboard. The underside of the unit has three notches to let you position the cord conveniently. One of its best features is one-touch cursor control provided by default on the four "definable function" keys. It also has a minus key, decimal, and RETURN key (labeled ENTER). The unit is light, but it won't tip over. To change the key values returned by the keypad, you can use the POKE command in BASIC to change locations using an alternate form of the handler program. You load the alternate handler from DOS, exit to BASIC with SYSTEM RESET, and POKE in replacement values. If you POKE in a value of 255, the function keys will behave like the console keys START, SELECT, and OPTION. You could change the four function keys to arithmetic symbols for a four-function calculator program. Or, for typing in program listings, you could change the period key (or the ENTER key) to a comma, and you'd have a high-speed way of entering DATA statements. A keyboard overlay is provided to let you label the functions. If you want to change the keypad's functions drastically, or relocate the handler in memory, you can modify the provided source code (machine language). The source code was written with the Atari Macro Assembler (AMAC), so you'll need the Program/Text Editor and AMAC to edit it (both are available from APX, the Atari Program Exchange). The Numerical Keypad comes with two manuals: a user guide and technical notes. The user guide is adequate for setting up and using the keypad for its primary uses. The technical notes are a laudable attempt to provide the intermediate to advanced user with solid information. A schematic of the keypad is even provided, along with theory of operation, suggested changes, and a listing of the handler routine. Since the VIC and Commodore 64 use an Atari-compatible joystick port, the technical notes may even permit you to adapt this versatile peripheral to the Commodore computers.